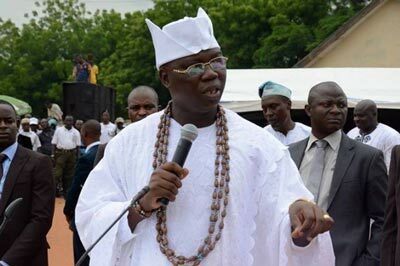 Alaafin of Oyo, Oba Lamidi Adeyemi, on Wednesday said the National Coordinator of the Oodua Peoples Congress, Gani Adams, was chosen as the new Aare Ona Kakanfo of Yorubaland after considering his antecedents as a Yorubaman who had exhibited passion for defending his people, their culture and tradition. The Alaafin on Sunday issued a letter of appointment to the OPC coordinator as the Yoruba generalissimo, thereby succeeding the late MKO Abiola, who was the last person to occupy the position. While reacting to the criticisms of the choice of Adams, the monarch explained that Adams might not possess the wealth and philanthropic strength of the late Abiola, but he was courageous and bold whenever he stepped forward to defend the Yoruba race. He said, “The choice of Adams was well thought out before a decision was taken. You may not place him beside Abiola in terms of wealth and other great achievements of the former Aare Ona Kakanfos among the Yoruba people and beyond, but Adams has shown enough charisma to deserve the honour. “If you have been observing him in the past many years, Adams attends all Yoruba festivals, irrespective of where they are held. He also promotes our culture through so many means including his annual Olokun festival. “I picked him because he loves the Yoruba race and all the culture and tradition of our people. He has contributed immensely to upholding them. Whenever he attends these festivals, he goes with a large entourage and financially, he is always responsible for the cost. He does not attend in order to benefit financially. The Alaafin said the OPC boss did not pay him anything to be made the Aare Ona Kakanfo, adding that wealth was not a requirement for the office. Money or material wealth is not considered before choosing an Aare Ona Kakanfo.